REGISTER TODAY. MEET THE WORLD. BEAT THE WORLD. For transportation, access to athletes village, area discounts. Become a Volunteer and help make the Games happen! Coaches, team photographers, therapists, etc. All official media and press requests apply here. Please note: Your Games registration username / password does not carry over to this website. Bracketing and venue assignments for several sports such as Ice Hockey and Golf will be completed April 2015. You may wish to book your accommodations in a central location to all Fairfax 2015 activities. We have selected four (4) areas you should consider based on your Games and vacation needs. The Athlete Village is the location for registration, Games information, competitions, nightly entertainment and socializing with fellow athletes. The new Silver Line of the METRO Rail system is close by providing you access to downtown Washington, D.C. and the entire National Capital Region. The Athlete Village is just 6 miles from IAD - Washington Dulles International Airport. Just minutes from downtown Washington, D.C., Tysons Corner is the Nation's Capital choice for selection, style and fashion. World-class shopping, dining and entertainment converge to offer the visitor a monumental experience. The new Silver Line of the METRO Rail system is close by providing you access to downtown Washington, D.C. and the entire National Capital Region. The largest university in Virginia and prime location just outside Washington, D.C. makes George Mason the destination for students from all over the world. Mason will be one of several major sports hubs hosting up to 12 sports during Fairfax 2015. The Orange Line of the METRO Rail system is a short bus ride away providing you access to downtown Washington, D.C. and a connection to the Silver Line up to Athlete Village! Located next to the Washington Dulles International Airport, the Herndon / Dulles area provides easy access to western venues. A bus ride or a rental car is recommended as the METRO Rail system does not yet reach the airport. The Athlete Village is just 6 miles to the east making this an ideal location for nightly entertainment and socializing! Use our interactive map below to find the closest hotels, transportation hubs, special discounts for credentialed athletes and more! 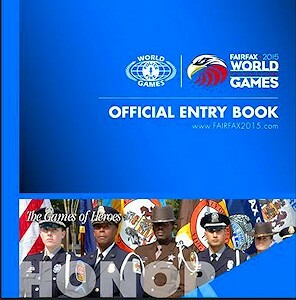 The 2015 World Police & Fire Games is pleased to announce complimentary, at no cost, bus transportation service to over 45 sporting venues for credentialed athletes, family members, and friends during the course of the 2015 Games. This unique opportunity allows riders direct, non stop service from one of 8 transportation hubs located throughout Northern Virginia to the selected sport venues. The transportation hubs are strategically located in close proximity to sport venues and clusters of hotels made available through the Fairfax 2015 Accommodations Team. Athletes are strongly encouraged to make their housing accommodations nearest to their sports for easy access to the transportation hubs and reduced travel time to the sport venues. Those wishing to utilize the bus transportation service are responsible for getting to the transportation hub (own cost) which services the sport venues. From the transportation hub, bus service will be provided to and from the venue. ,p>When selecting a hotel, please consider what is of most importance to you such as closeness to sports venue, Athlete’s Village, Metro Rail accessibility, and more. 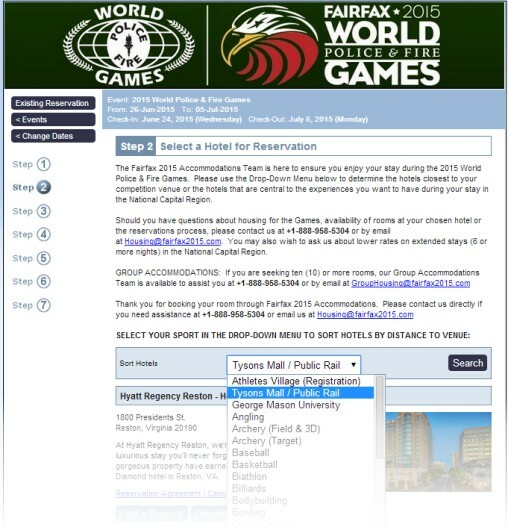 Currently, some hotels do not offer rooms throughout the entire 10 days of the Games and may only appear when the search is confined to the actual dates of the particular sports competition. Consequently, it is possible to overlook hotels because the search expands beyond what certain hotels are currently offering. If this is the case, please contact us directly to inquire about securing more days.